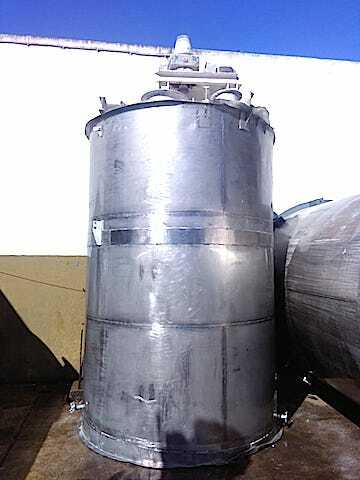 TANQUE CILINDRICO VERTICAL CONSTRUIDO EN ACERO INOXIDABLE CALIDAD AISI 304 PARA 12.000 LITROS DE CAPACIDAD NOMINAL DE CARGA, ALTURA 3.200 MM. X 2.200 MM. DE DIAMETRO, MOTOR DE 3 HP. REDUCTOR DE VELOCIDAD, AGITADOR CENTRAL TIPO IMPELLER, DESCARGA LATERAL INFERIOR, TAPA DE CIERRE HERMETICO, BOCA ENTRADA DE HOMBRE DE 400 MM. DE DIAMETRO.